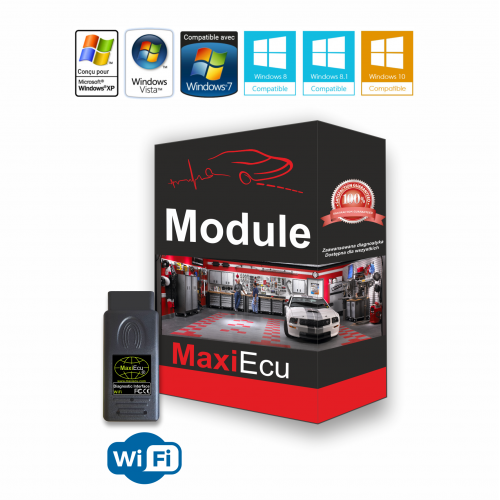 MaxiEcu is a complete diagnostic system. The set consists of interface and original software. What makes us different? The most of interfaces on the market are OBD2 that only enable the diagnostics of an engine. With MaxiEcu You will do 300% more - You will perform service diagnostics, including: DTC ( Diagnostic Trouble Code) - the reading and erasing faults, doing the tests, coding, adaptations, DPF regeneration, deleting inspection, retracking brake calipers, ABS, AirBag, AT, ESP, Immo, UPS, BCM, etc. The system is an authorial solution of the Polish engineers. MaxiEcu software has maximally simplified the adaptation and coding procedures. In order to launch the platform all You need is a tablet, a laptop or PC with Windows operating system. Thanks to it You can feel comfortable and make use of the system features with ease. The system is friendly diagnostic platform adjusted to passenger cars and supply trucks. Definitely the most important element of the set is the electronic interface - equipped with a multiplexer and firmware update functions. You can choose from three types of interface: USB, Bluetooth and WiFi. Bluetooth and WiFi interfaces can also be connected to a laptop through USB cable. MaxiEcu is intuitive, user-friendly, easy to understand, without the need to read the instruction manual. From the time you have to installed the MaxiEcu you are ready to start the comprehensive diagnostic session. We develop and improve MaxiEcu software, thanks to it You can be up to date with new vehicle models and solutions in car electronics. With MaxiEcu Your work is more efficient and economical - as a User you obtain access to free system updates. Buying MaxiEcu system You will get access to the User Account where You have an opportunity to view the purchased products, to verify the awarded licenses and to manage the data on the software version that You have. Through the User Account You can also easily contact the technical support and also download the current software version. Choosing MaxiEcu You will become the owner of the legal and safe software. The license is connected to the interface, which is the hardware key. It means that You can install and use the software to as many device as You wish. You can choose a tablet, a laptop or PC - all you need is the Windows system. Below You will find the search engine of MaxiEcu functions. Before the purchase please make sure to what extent does MaxiEcu run a chosen brand. After the purchase, we send you the activation link to the MaxiEcu user account to the e-mail address provided, from where you can download the latest version of the software. Supported languages English, German, French, Romanian, Greek, Italian, Polish. WiFi coverage 100m (range in open space) In addition, the interface has a USB port.